Our Wedding Guild serves as a liaison between our church and the wedding party. A representative of the church’s Wedding Guild will contact the bride and groom once the application and fees are submitted to the Church Office. Wedding Guild members are present during the rehearsal and the wedding. If you have contracted with a wedding coordinator, he or she is welcome to be present, and our Guild member(s) will work with your coordinator so that the wedding party is aware of plans made by the Pastor and the bride and groom. 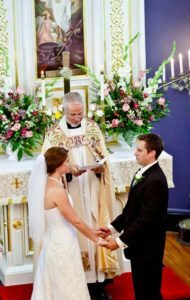 If serving on our Wedding Guild interests you, or if you wish to learn more about it, please call our church office: 843-722-8906, or you can email our parish administrator at office@stjohanneschurch.org.